ECORASTER® products have practical, and downright unbeatable, applications for landscapers and homeowners. One of the most common uses is as a permeable ground stabilizer for bike paths, nature paths, and walking trails, but these permeable grass pavers can also be used for landscaping purposes such as reliable garden shed flooring. Got a home away from home? ECORASTER® is an economical and environmentally friendly alternative to concrete boat ramps and RV parking at your recreational property. Those looking for permeable grass pavers that will also provide for reliable ground stabilization and erosion control should look no further. 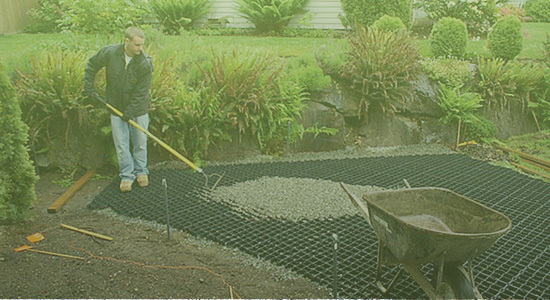 The ECORASTER® line of products is built to serve as the only ground stabilization you will need for any project, large or small. When it comes to permeable ground stabilization solutions for landscaping application, careful attention must be paid to the toughness and properties of each product. Some of the more durable models, like ECORASTER® Bloxx and the X30, are designed to handle paver stones and asphalt surfaces for driveways and parking lots. They are also a sustainable and easy alternative to concrete for RV parking, and boat ramps. However, the ECORASTER® E30 model is one of the more frequent permeable grass pavers that is used for landscaping purposes. B8 Ventures is the leading distributor of ECORASTER® permeable grass pavers for landscapers and homeowners. Our ground stabilization products provide tailor-made solutions for a variety of needs, and the best part about it is that you’ll get peace of mind in knowing that you are leaving behind a minimal carbon footprint with our products. That’s because ECORASTER® products are made from 100 percent recycled, eco-friendly materials that carry a 20-year manufacturer’s warranty, all with the guarantee that your permeable grass pavers will hold up to the elements. Place your initial order or contact B8 Ventures online today.